Inside The State Of The Union: What The President Proposed : It's All Politics After a long spell of partisan trench warfare and gridlock, President Obama called for "a year of action" Tuesday. The changes he pitched were relatively modest, but he promised to move forward with or without the help of Congress. 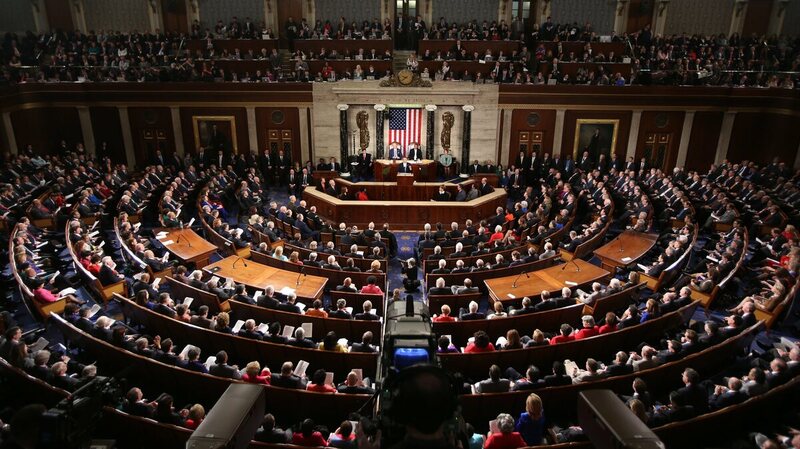 President Obama delivers his State of the Union address before a joint session of Congress on Tuesday. After a long spell of partisan trench warfare and gridlock, President Obama called for "a year of action" Tuesday as he focused on themes that are central to his second-term agenda. The changes he proposed in his annual State of the Union speech were relatively modest, but flashes of ambition showed in his promise to move forward, with or without Congress, to address issues of income inequality. Twelve months ago, Obama called on Congress to raise the federal minimum wage (spoiler alert: they didn't do it). He made that same call again in his 2014 State of the Union address, but this time with a twist. He said that "in the coming weeks" he would issue an executive order raising the minimum wage for employees of federal contractors to $10.10 an hour. "[B]ecause if you cook our troops' meals or wash their dishes, you shouldn't have to live in poverty," he said. But there are still a number of details to fill in. It's not clear just how many people will get a raise as a result of this planned action, and administration officials who briefed reporters weren't able to supply a number. One reason it's hard to know: This will only apply to new federal contracts, so people working now for less than $10.10 could keep making the same wage unless their employer signs a new contract with the government. "Let's understand something: This affects not one current contract," House Speaker John Boehner said hours before the speech. "It only affects future contracts with the federal government. And so I think the question is, how many people, Mr. President, will this executive action actually help? I suspect the answer is somewhere close to zero." Still, it represents a victory for low-wage workers who held walkouts and other actions to draw attention to their plight. Progressive Democrats — who have been calling for the president to sign an executive order giving these workers a raise — plan to watch closely as the executive order is drafted. They want to make sure that any new minimum wage is indexed to inflation. Obama will tour a Costco warehouse store in Lanham, Md., Wednesday morning to highlight how that company pays employees more than minimum wage. In his address, the president called on other employers to do the same and encouraged states and cities to raise their own minimum wages. "I say, you don't have to wait for Congress to act," said Obama. "Americans will support you if you take this on." Obama also continues to call on Congress to pass minimum-wage legislation, as he did in last year's State of the Union. But congressional Republicans have made it clear this isn't something they intend to do. They argue that raising the minimum wage will hurt businesses and, by extension, low-wage workers. "When it comes to the federal minimum wage, listen, I used to be an employer," Boehner added. "When you raise the cost of something, you get less of it." President Obama had nothing new to offer on health care, but he was not going to miss the opportunity of his biggest audience of the year to plug the Affordable Care Act. In just a few sentences, the president managed to highlight the most popular and successful elements of the health law — things like guaranteeing coverage to people with pre-existing health conditions and letting young adults stay on their parents' health plans — while making no mention of the problems that have plagued the law's rollout. Enrollment numbers that seemed dismal just a month ago suddenly seem robust enough to become fodder for the speech: "More than 9 million Americans have signed up for private health insurance or Medicaid coverage," he said, referring to the 3 million people who have signed up through state and federally run exchanges through late January and the more than 6 million found eligible for Medicaid or the Children's Health Insurance Program between Oct. 1 and the end of 2013. He challenged Congress to stop trying to repeal the law — which brought a thundering ovation from Democrats who are up for election in the fall — and urged those who don't have insurance to get it before open enrollment ends March 31. "Moms, get on your kids to sign up. Kids, call your mom and walk her through the application," he said. Not surprisingly, Rep. Cathy McMorris Rodgers, speaking for the Republicans, had pretty much the opposite view of the law. "No, we shouldn't go back to the way things were," she said in her rebuttal, "but this law is not working. Republicans believe health care choices should be yours, not the government's." Interestingly, neither the president nor McMorris Rodgers mentioned one of the most contentious elements of the law now working its way through the courts — the requirement for most health plans to cover FDA-approved contraceptives without deductibles or co-payments. The requirement has prompted dozens of lawsuits from religious and private employers and is headed to the Supreme Court this spring. There was also scant attention to Medicare, other than Obama's passing mention that the Affordable Care Act would expand benefits to seniors and shore up the program's financing. Republicans used the Medicare spending reductions in the law to hammer Democrats in the 2010 elections, but since then most of their proposals, including one unveiled by senior GOP senators this week, would leave those spending reductions untouched. As expected, the president maintained a light touch as he tasked Congress with doing what he asked it to do in the last State of the Union — pass immigration reform. Noting that both Democrats and Republicans in the Senate had already acted, Obama said he knew members of both parties in the House wanted to do likewise. "So let's get immigration reform done this year," he concluded. Notably, he did not call for the House to pass the path to citizenship that the Senate bill made available to the millions of immigrants currently in the country without authorization. He didn't ask for a comprehensive bill, nor did he endorse the step-by-step approach House Republicans advocate. The president essentially left House Republicans to own whatever they come up with — he seemed to recognize that any policy prescriptions he dispensed would likely backfire. As he and other Democrats know, failure to do anything on immigration will likely further erode the GOP's already low standing with Latino voters. The GOP has a strong incentive to act — and Obama tried Tuesday night not to get in the way. The president's claim that the longest war "will finally be over" represents standard fare — and he broke no new ground on the question of the security agreement with Afghanistan. Some 10,000 troops may remain in Afghanistan after this year if that deal is signed, so the idea that the war is over is a bit of a stretch — albeit a stretch the White House has been making for a year. The speech captured the tension between security and politics: that the White House very much wants the war to be over, but that to leave too quickly could lead to chaos on the ground in Afghanistan. And that debate is playing out now inside the Obama administration. The first item that needs to be resolved is this: Will Afghanistan's president sign on to a bilateral security agreement that all sides thought was done last fall? Instead, Afghan President Hamid Karzai has held it up and made the relationship more and more complicated. If the deal falls through, it's most likely that no U.S. troops will remain beyond the end of 2014 — sometimes called the "zero option." If the deal is agreed to — and this may not happen until the April election in Afghanistan — then the U.S. must decide how many troops would remain. The Pentagon is pushing for about 10,000. The military is telling the president's team that it needs that many troops to carry out two key missions: counterterrorism and the training of Afghan troops. Others inside the White House want a much smaller number. It could be weeks or months before we know what number the White House settles on. The winding down of the war in Afghanistan raises a broader question: When does the war on terrorism ever end? In his speech Tuesday evening, the president said: "America must move off a permanent war footing." It's a theme the president first outlined in a May speech at the National Defense University. The legacies of the war on terrorism are Guantanamo, drones and surveillance — practices that the White House is looking to change. The big idea is that all were justified by the idea of permanent war. After the Sept. 11 attacks, the nation created a new national security state that was, to put it charitably, improvised. That led to the use of torture, or what became known as enhanced interrogations. Those early days, in late 2001, marked the start of the NSA surveillance programs that evolved over time and are at the center of national debate today. Likewise with Guantanamo. But if that "permanent" war comes to a close and terrorism ceases to dominate national security policy, then there may no longer be a rationale for these policies. The hard part is getting there — finding a way to do away with them. Congress makes it all but impossible to close Gitmo; drone strikes are on the decline but still too central to counterterrorism policy; and NSA surveillance changes are taking place at the margin. For example, in a speech a week ago, the president called for the government to stop collecting the phone records of all Americans, the so-called "metadata" program. But he does not want to end the program entirely, only to reform it. That's the part no one has the answer to. If the government doesn't hold those phone records, who does? Note also that this was the one place in the State of the Union address where the president alluded to the debate over surveillance and the NSA. It got one sentence. Permanent wars are hard to end. Obama's remarks on moving off permanent war footing were part of laying out his case for "strong and principled diplomacy." He used his State of the Union speech to urge Congress to give U.S. diplomats some room to maneuver, particularly when it comes to Iran. "We must give diplomacy a chance to succeed," he implored. He warned lawmakers that he would veto a new sanctions bill, which Obama said could derail talks on rolling back Iran's nuclear program. Fifty-nine lawmakers are co-sponsoring a new sanctions bill, which Senate Foreign Relations Committee Chairman Robert Menendez, D-N.J., portrays as a diplomatic insurance policy. It would impose new sanctions if talks fail to persuade Iran to curb its nuclear ambitions. "If Iran's leaders do not seize this opportunity, then I will be the first to call for more sanctions," Obama told a skeptical Congress, "and stand ready to exercise all options to make sure Iran does not build a nuclear weapon. " On Syria, the president broke no new ground, saying only that American diplomacy is "why Syria's chemical weapons are being eliminated." He added that his administration is also trying to help "achieve an independent state for Palestinians, and lasting peace and security for the state of Israel — a Jewish state that knows America will always be at their side." $75 billion over the next 10 years to expand preschool programs — that's what the president initially proposed last year by raising cigarette taxes. This would be the main source of new funding earmarked for states to enroll all 4-year-olds in state-run programs by 2020. But despite the president's call Tuesday for making "high-quality pre-K available to every 4-year-old," it's unlikely that Congress is going to take this up, despite growing support in state legislatures. Forty states and the District of Columbia today enroll 1.1 million mostly poor 4-year-olds at a cost of $5.6 billion. Thirty have increased funding for preschool in the past year by 7 percent — in 10 states, by more than 20 percent. And yet state-run programs are only reaching about 30 percent of eligible children — 40 percent if you add the number of low-income children in Head Start. On community colleges, the president announced new partnerships with business to create job training programs and apprenticeships. But community college leaders have complained that the federal aid to do that is not nearly enough to make up for huge cuts in state funding for their institutions. In states like California, community colleges are for the first time having to turn away students. As part of the "opportunity for all" theme, the administration has embarked on a campaign to increase the number of low-income, college-eligible students who enroll and complete college. Currently, no more than half of these students apply to college. The president made clear that higher education is one way to deal with income inequality by creating a path for poor young people to make their way into the middle class and beyond. More than 150 college presidents have signed onto this campaign, vowing to reach out to more poor college-eligible students and offer more financial aid and support services on their campuses for these students. As for his "Race to the Top" initiative to raise the quality of schools and student performance, the president said it "has helped states raise expectations and performance." But American students are still far behind in math and reading compared with other industrialized nations. Many educators complain that the president's policies have been used as a carrot-and-stick approach that distributes about $4.5 billion to states on the condition that they adopt reforms prescribed by the administration — like creating career- and college-ready standards, shutting down failing schools and paying teachers based on their performance and kids' test scores. All of it is highly controversial — and it's generating lots of pushback from teachers unions, parent groups opposed to testing, and minority community activists who say their neighborhood schools are being shut down and replaced by privately run charter schools (or what some call "the privatization of public education").